Take the lukewarm water and mix in yeast, 1 1/2 tablespoon sugar and salt. Let the yeast develop for 15 minutes. In the meanwhile you can melt the butter. Now take a large bowl and put in the flour, make a hole in the middle, pour in the yeast that you made in step one. Also add beaten eggs and melted butter. Knead until you get nice and even dough. Then let it rest so the yeast does it's magic and the dough doubles. Now take pearl sugar and gently mix it in. Again, let it rest for 15 minutes, in the meanwhile you can turn on the waffle maker so its nice and hot. 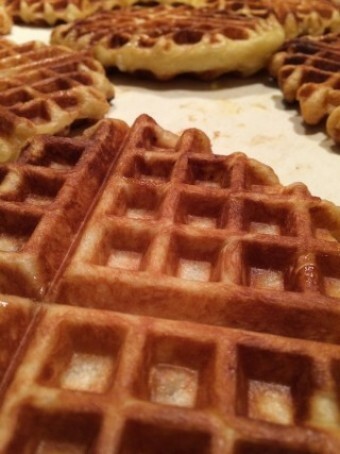 Pour the waffle dough into the waffle maker and bake for 3-5 minutes. Because we mixed in the sugar late in the process it will melt and caramelize and give that special Liege waffle taste. ***Be careful when you take them out of the waffle maker, caramelized sugar can make them sticky.